Toxic algae outbreaks continue to be a worsening issue not only for OHOP LAKE, but in other Pierce County lakes. This brochure from the Tacoma Pierce County Health Department helps to explain the problem. If you have an outhouse or a non-approved septic system….you are contributing to the problem. If you have a grey water system…you are contributing to the problem. If you are fertilizing your lawn….you are contributing to the problem. You can get updates from Pierce County Health Department by calling the Health Department at 253.798.6470 or e-mailing EHSurfaceWater/Shellfish@tpchd.org. You can also visit their website by clicking here. Not everyone is on the Ohop Lake email list, so please check with your neighbors to make sure they know about this issue and aren't contributing to the problem. Aqua Technex was used for our latest treatment. Click here for their suggested Plant Management Plan. We perform two water quality tests twice a year, usually in the spring and fall at the two deepest GPS points on the lake and four times a year on the stream flowing in to the north end of the lake. These are through the Pierce County Conservation Corps Stream Team monitoring program. We measure the temperature, water clarity, and dissolved oxygen at both and nitrates on the stream. Additionally, the Nisqually Land Trust also does fall and spring water testing, same tests, on Lynch Creek coming into Ohop Lake on the south end by Ski Park Road with local 4th graders. This has been going on for about 27 years. All of the water testing sites throughout the Nisqually River Basin then share their annual results at a Green Congress each spring. Considering Septic, Outhouse, Gray Water Drainage? If a property on Ohop Lake (Pierce County) changes legal owners an existing septic tank must be pumped and inspected along with the drain field. Results of the inspection are passed on to the Pierce County Health Department for final determination. Existing septic tanks on Ohop Lake are grandfathered in as long as they pass a visual inspection and are operating properly during normal servicing. Anti-Bacterial soap, powdered detergents, bleach, medicines, particularly antibiotics should never be introduced into a septic system on Ohop Lake. They will kill the good bacteria in a septic system and eventually find their way into the lake. Should the cost of a septic system be cost prohibitive a property owner can install a holding tank, usually the 1200 gallon variety. As with a septic tank a holding tank would collect all waste up to and including gray water. Installation costs run about $5000.00 which includes permits, labor, hook-ups and holding tank. Property would need to be backhoe accessible. Full-time family usage would require weekly to semi-monthly service. On those properties with ancient outhouse facilities, a simple solution is a Honey Bucket. Honey Buckets can be leased ($115.00 per month including monthly service) or they can be purchased outright for about $250.00 and be serviced on an as needed basis (about $65.00). Property owners wishing to install septic systems and or holding tanks may be able to get financing through Craft 3 Loans (information available on the website) and in some cases the Pierce County Housing Authority. Do you have an interest in water quality testing or the health of Ohop Lake? Please consider getting involved and joining our Water Quality Committee. Canada Geese on Ohop Lake can be a nuisance to some, while others enjoy them. 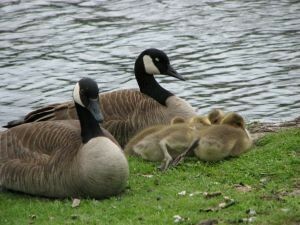 Unfortunately, the geese population has an effect on the water quality of Ohop Lake. 1. Tips on Keeping Resident Canada Geese From Becoming a Nuisance in Your Neighborhood. 2. Managing Problems Caused by Urban Canada Geese. 3. USDA Resolves Wildlife Conflicts in Washington.